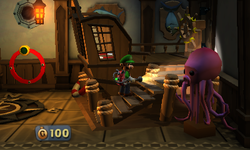 The Nautical Exhibit is a room in Treacherous Mansion in Luigi's Mansion: Dark Moon. Located on the east side of the mansion just south of the Study, the main entrance is from the East Corridor to the east of the room. Inside this room, there are various displays related to ships and sailing. The east side of the room has a giant ship with a switch, wheel and door, this door leads to the outside area of the Nautical Exhibit. There's also an octopus statue that can be interacted with to cause damage to Luigi here as well. On the north wall is an E-Gate attached to a rotating section of wall that leads to the Front Entrance. Finally, on the other side of the room is a ship wheel that moves the the compass towards the north end of the room, making the needle point to the north flips the E-Gate around so it's in the Study instead of this room. Beyond the door to the east is a second part of the Nautical Exhibit. This part of the exhibit is on top of the pirate ship sticking out the east wall of the Treacherous Mansion, and has a treasure chest with a gem inside. There are also many Crows here. In A Train to Catch, Luigi must enter this room and solve some puzzles to make the E-Gate flip around and face the Study rather than this exhibit. There's also fog entering the room from a porthole near the ceiling and a Strong Slammer pushing the ship wheel around; both of these things must be taken care of for Luigi to progress with the mission. In Paranormal Chaos, the Nautical Exhibit is one of the first rooms that ghosts appear in once the paranormal portal has been opened. In here Luigi will face multiple Slammers and Strong Slammers. In Terrifying Invasion, the Nautical Exhibit may be one of the rooms infested with ghosts. This page was last edited on November 10, 2017, at 19:20.